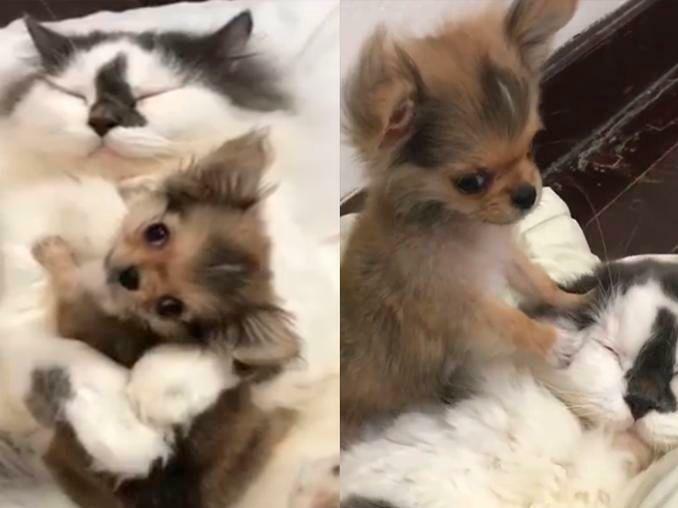 In the video, the cat shows all her love and affection to the little dog by completely giving it with motherly hugs and caresses. The incident was captured by the owner of both pets. In the video, you can see an adult cat next to a small dog a few months old while all kinds of affection are given. The cat embraces the little dog. They both sleep together, while the cat allows the little dog to play with her and gives her little bites all over her body. In the rest of the clip, you can see how both animals, despite being of different species, act as if they were a mother and a puppy united by blood. Without a doubt, once again, animals teach us true love and give us a lesson in life. The video was uploaded on Facebook and the majority pointed out that they had been moved many emotions and that humans should learn from them.